Television show host and nutrition expert Dr. Oz is stopping by TODAY to share tips from his new book, "Food Can Fix It: The Superfood Switch to Fight Fat, Defy Aging, and Eat Your Way Healthy," which breaks down easy ways to improve your health through diet. Based on his own research, Oz reveals the best foods that may help alleviate a variety of health issues. 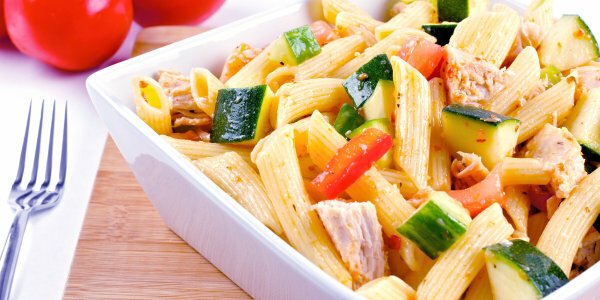 He also shows us how to make a healthy chicken pasta recipe featuring those good-for-you ingredients. Eat your way to a healthier heart by enjoying lean proteins, incorporating new foods into your diet and switching to sources of healthy fats. Foods with beneficial fats: Edamame, nut and seed butters, olives, seeds oils (hazelnut, olive, avocado, soybean, flaxseed), avocado and nuts all have healthier unsaturated fats and benefits like omega fatty acids as well as artery-clearing functions. Try new foods: Explore your farmers market for new and interesting fruits and veggies to keep eating healthy from getting boring. Try things like kohlrabi, jicama, mangosteen, bok choy, chayote, dragonfruit and dandelion greens which all provide essential vitamins and minerals. Lean proteins: Rely on lean meats and fish for your protein intake to reduce your overall fat consumption. Think boneless and skinless chicken breast, tuna, pork tenderloin, cod, etc. Water is one of the best weapons against inflammation and pain because dehydration can cause headaches. But plenty of other foods can help clear up inflammation, too. Make healthy meals: Skinless salmon, leafy greens, extra virgin olive oil and red wine (in moderation) all have excellent anti-inflammatory properties. A dinner composed of these elements is pretty much the ultimate anti-inflammatory and pain reducing plate because fish contain healthy omega-3 fatty acid, red wine has resveratrol and olive oil has been shown to have anti-inflammatory properties. Coffee and cinnamon: Add a dash of cinnamon, which has two known anti-inflammatory chemical compounds, to your daily coffee. Along with coffee, this will double the dose of your morning beverage's anti-inflammation power — plus it will impart a nice spicy flavor to your brew. Water: Don't underestimate your water intake. Staying hydrated is key to an overall healthy body and will likely help reduce any incidents of chronic headaches. Try to drink six 8-ounce glasses of water every day. Eating small, healthy snacks throughout the day can help stabilize your blood sugar levels and your mood. Yes, it's true, being "hangry" is a thing, so don't wait until you're starving to eat — you'll likely get pretty irritable. Also, you'll be less likely to binge on unhealthy foods later if you're not starving by the time you get a chance to eat. Staying satisfied and eating every few hours can make your belly and mind happier and healthier. Sweet: If you have a sweet tooth, try eating a piece of fruit with nut butter instead of a sugary snack like a candy bar. Crunchy: If you crave crunchy snacks, eat roasted chickpeas or kale chips instead of greasy potato chips. Creamy: If you want something comforting and creamy, don't eat ice cream — reach for a cup of Greek yogurt. Too boost the flavor, mix up plain Greek yogurt with a drop of vanilla extract and add some berries for a low-sugar, satisfying snack. For more ideas around healthy eating, check out TODAY Food's lists of their favorite healthy cookbooks and the healthy snacks nutritionists give to their kids.